List of 50 thinkers in the area of Economics and Governance was unveiled at THINKERS Sandbox, an event was held at The Imperial, New Delhi on August 9, 2017. The list includes distinguished set of reformers, influencers, financial architects and academics like Bimal Jalan, Bibek Debroy, Rakesh Mohan, Arvind Subramanian, and Shashi Tharoor. Anupam Kher released the list at the event. Two book unveilings also occurred at the event. Bimal Jalan released his book titled “India: Priorities for the Future” while Gurucharan Das launched his box set “10 Extraordinary Tales of Trade”. The list was formulated after careful deliberation on how these thinkers enable discourse in society and what is their level of public outreach. These characteristics were adjudged based on their book publications, newspaper contributions, social media engagement and influence in public policy with a preference for ones based out of India. There will be an annual publication of such a list of thinkers in India. It aims to act as an essential guide on the thinkers and the ideas that have contemporary relevance in modern India and its development and recognise the independent minds of the country that have made it a better place and shaped a better future for it. To view the complete list and for more detailed information click here. Thinkers is a quarterly thought leadership magazine with articles, interviews, and thought pieces from the brightest thinkers in the areas of economics and governance; philosophy and literature; science and technology; and management. It is an initiative of Institute for Competitiveness & Thinkers50 India. Dr. Amit Kapoor is the Editor-in-Chief Thinkers and is also an advisor to Thinkers50. He is also the Chair of Institute for Competitiveness and is President & CEO of India Council on Competitiveness. Recently, he has authored the book Riding the Tiger published by Penguin India. 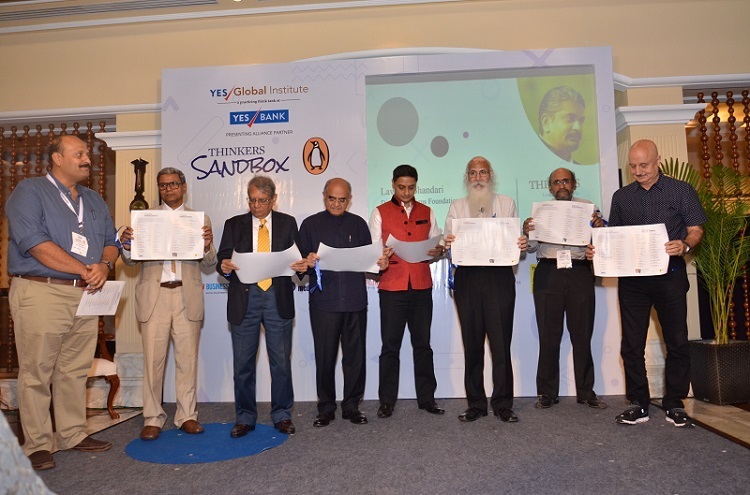 THINKERS Sandbox, an event held by THINKERS & Penguin Random House with YES BANK and the YES Global Institute as the Presenting Alliance Partner, announced a list of top 50 thinkers in India in the field of economics and governance. The list was unveiled by Anupam Kher at the event. It included a distinguished set of reformers, influencers, financial architects and academics.